Last year was the first edition, and obviously the final day was intense. Weve got students coming from all over the world: Australia, Thailand, Mexico, US, Canada… from everywhere! Staying 5 weeks in Paris, a city they don’t know was a huge personal investment, as to stop everything in order to focus 100% on type design. We usually see a strong motivation from the start and what they do they often go beyond their own expectations. 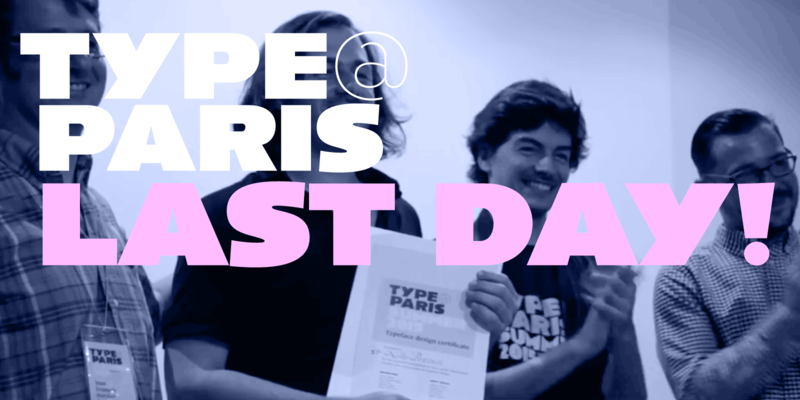 Last day, TypeParis15, July 2015. This short video is a great souvenir from the memorable last day. A typeface is initially just designing black on a white background, even only on paper in the beginning. Our specific teaching process lead the students to use their own typefaces at the end of the 5 weeks. Our attendees are all excellent graphic designers, knowing they aren’t born into type design from the first place, but learnt to love typefaces by using them. At one point during the programme, they step through the looking glass and start to use their own fonts the same way they would use fonts designed by others. It was a wonderful moment. Here, we have experienced and professional graphic designers who know how to use typography. Using their own typefaces at this precise moment was powerful, as we were on the last day after intense 5 weeks designing everyday typefaces. 5 weeks, non-stop using the same shapes, the same black, white, upstroke, downstroke, serif, ascenders, descenders… at the end, looking at these typefaces in use is just magic. The extract of the final presentations you can see on the video have been mainly designed between in 24 hours. The level of excitement generated by these presentations was intense. Thanks to Mi Prod, a French video company, who produced this short video about it. The video is in French, despite the main language of the programme is English. But hopefully the subtitles as the images do their job!